Community-Style Acupuncture is the primary model of acupuncture care in other parts of the world but the movement in the United States began in the late 90s in Oregon. It aims to increase accessibility to acupuncture care by offering a sliding scale fee of $20-$40 per treatment and offering more convenient appointment times. Rather than seeing one patient per hour or having multiple private rooms, an acupuncturist is able to keep costs down by seeing multiple patients per hour in a large room set up with comfortable recliners. Upon joining the Synergy Center, Kari decided to leave behind the traditional Western acupuncture model of treating one patient at a time (at a higher cost) and adopt the Community-Style acupuncture model. Kari feels community acupuncture is a perfect fit for the Synergy Center, in particular, so that clients will not have to choose acupuncture or homeopathy/naturopathy/massage/etc., but, can choose acupuncture and their other wellness therapies. CNY Community Acupuncture offers flexible day, evening and weekend hours to fit your needs. Please see the home page for a current schedule. 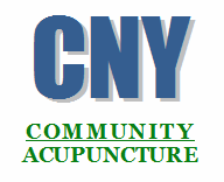 CNY Community Acupuncture can be reached by calling Kari at 315.925.8888, or by sending an email to CNYACU@gmail.com. The address of CNY Community Acupuncture and The Synergy Center is 4500 Pewter Lane Bldgs 8 and 9, Manlius, NY 13104. We are in the dark brown building behind the Manlius True Value and we are on the corner of Market Place and Pewter Lane. Coming from Manlius village: follow route 92 south toward Cazenovia, turn left onto Enders Rd., take your first right into Market Place and we will be on your left. Coming from Cazenovia village: Head north on route 92 toward Manlius, turn right onto Pewter Lane, turn left onto Market Place and we will be on your right. Coming from Chittenango village: Take route 173 west toward Manlius, turn left onto Enders Rd., turn left at Market Place and we will be on your left.